ImgBurn 2.5.8.0 Portable » SoftLab - портал portable-софта! Помимо всего перечисленного, в ImgBurn можно проводить верификацию данных на носителях, анализировать качество записи и получать различного рода сведения, как о диске, так и о физической его структуре. Присутствует возможность осуществлять поиск в Интернет и последующую загрузку новых версий прошивок для данного привода. Можно изменять метку ISO-образа, блокировать/разблокировать открытие лотка привода и т.д. Очистка дисков поддерживается как быстрая, так и полная. ImgBurn is a lightweight CD / DVD / HD DVD / Blu-ray burning application that everyone should have in their toolkit! It has several 'Modes', each one for performing a different task: Read - Read a disc to an image file; Build - Create an image file from files on your computer or network - or you can write the files directly to a disc; Write - Write an image file to a disc; Verify - Check a disc is 100% readable. Optionally, you can also have ImgBurn compare it against a given image file to ensure the actual data is correct; Discovery - Put your drive / media to the test! Used in combination with DVDInfoPro, you can check the quality of the burns your drive is producing. ImgBurn supports all the Windows OS's - Windows 95, 98, Me, NT4, 2000, XP, 2003, Vista and 2008 (including all the 64-bit versions). If you use Wine, it should also run on Linux and other x86-based Unixes. 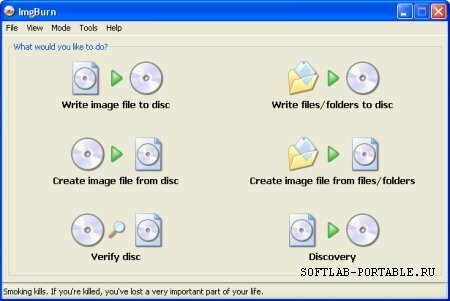 It's a very flexible application with several advanced features that are often lacking in other tools, especially when it comes to burning DVD Video discs. It supports all the latest drives without the need for updates (including booktype / bitsetting / advanced settings on many of the major ones - i.e. BenQ, LiteOn, LG, NEC, Plextor, Samsung, Sony).